A favorite post which my new and old subscribers may enjoy in preparation for Easter. Southern Italians celebrate Pasqua or Easter with the gamut of ricotta type pies ranging from savory to sweet. Campania is famous for a mildly sweet wheat berry pie called Pastiera; a crostata made with ricotta cheese, cooked wheat grain and delicately scented with the flavor of orange blossom. Although Pastiera is a staple on the table for southern Italians at Easter, our preference has always been the Crostata di Ricotta, often referred to as the Italian Cheesecake. Honestly, the comparability between Crostata di Ricotta and what we have come to know as cheesecake is minimal; yes they both use a type of cheese as a essential ingredient. Crostata di Ricotta is much lighter, not terribly sweet and dotted with a few bits of candied orange, citron and chocolate. The mixture is enveloped in a delicate Pasta Frolla using a lattice top. I remember going to the neighborhood Italian grocery store for a preforated tin of ricotta covered with wax paper, secured with an elastic band; I dreaded that errand since the milky residue from the ricotta would invariably drip all all over me while walking home. Thinking back, it was certainly worth it; my taste memory of the flavor of the tinned ricotta was unmatched even by today’s artisanal products. When contemplating making this dish as part of a menu, my preference is to use sheep’s milk ricotta. Sheep’s milk has a higher fat content than other milks and imparts a tangy complex flavor to the ricotta. Regardless of the type of ricotta, draining overnight rids the ricotta of it’s excess liquid leaving a rich creamy substance. Before incorporating the drained ricotta into a recipe, rub it through a screen or sieve to create a smoother base for the dessert. If you have already attempted Pasta Frolla, you are more than ready to try Crostata di Ricotta. Buon Pasqua a tutti! If you have enjoyed this post by subscribing below you will receive a weekly update each Monday. A traditional southern Italian specialty at Easter. Butter a 9" springform pan. Take the prepared Pasta Frolla out of the refrigerator and from one of the discs roll out a circular piece of pastry to fit the bottom of the springform pan (you will have pastry dough left over which will be used for the sides of the shell). Using the remaining pastry dough and some from the second disk, roll out two three inch strips of dough whose combined length will cover the interior sides of the pan. Trim the dough using a pairing knife and straight edge so that the edges are uniform. Take one piece of the dough and gently place it around the sides of the pan, having the lower edge of the length of dough meet with the base of the pastry. Use your fingers to join the bottom and sides of the pastry so that there are no gaps. Continue with the second piece of dough to complete the shell. Roll the remaining dough to be cut into strips for the lattice top. Refrigerate both the springform pan and the pastry for the lattice for at least 4 hours or overnight. Preheat the oven to 350º. Remove the pastry dough from the refrigerator and line the springform pan with aluminum foil and beans. Bake the shell for 10 minutes, carefully remove the foil, continue to bake for an additional 3 minutes to dry the bottom of the pastry. If the pastry begins to rise in the center, gently push it down with a spoon. Remove from the oven and cool completely. While the pastry shell is baking cut 1" strips from the remaining pastry and put back into the refrigerator. Preheat the oven to 350º if necessary. Remove the drained ricotta from the refrigerator, discard the milky residue. Place a strainer over a bowl and using a spatula or soup spoon, take about ½ cup of ricotta at a time and rub it through the strainer; continue until you have rubbed all of the ricotta through the strainer. Make sure to scrape the ricotta from the bottom of the strainer. Add the grated orange rind, vanilla and sugar to the sieved ricotta and mix well with a spoon. Add the 3 eggs, combine until the mixture is uniform. Finally add the candied citron, candied orange and chocolate - mix together thoroughly. Spoon the ricotta filling into the chilled pastry shell. Remove the pastry strips from the refrigerator and begin to form the lattice top, starting at the edge of the right side of the pan vertically. Work the next strip at the bottom going in a horizontal direction. Continue laying the pastry strips in this manner, weaving over and under and alternating until you have completed the lattice top. It is best if you lay the strips down without pressing into the ricotta filling as it will be easier to lift when completing the over and under process. Press the edges of the strips into the sides of the pastry, trimming with a pairing knife as you go a long. 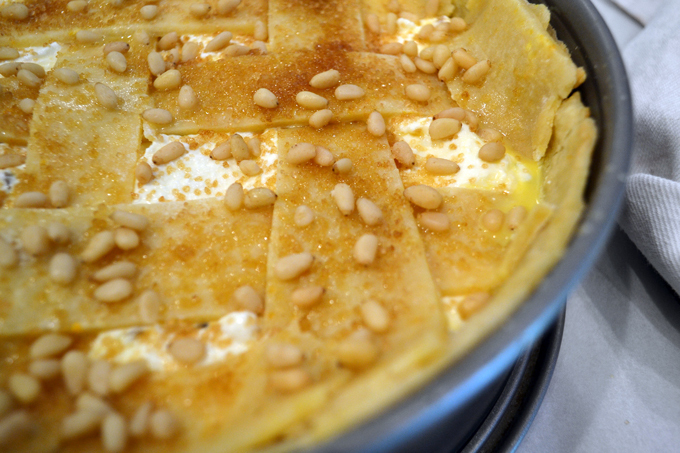 Brush the lattice top with the egg wash, sprinkle with the pine nuts and turbinado sugar. Place the filled crostata into the oven and bake for 30 minutes. Open the oven at this point and cover the edges with aluminum foil if they appear to be browning too quickly. Bake for an additional 12 to 15 minutes or until the lattice becomes golden and the filling puffs and is firm to the touch. Remove to a rack and cool completely before opening the sides of at the springform. Transfer to a cake plate and serve that day. Do you precook the Pasta Frolla, or assemble with uncooked (only steps 1 – 8 of Pasta Frolla recipe? Hi Craig, yes you do prebake the pasta frolla shell – take a look at step 4. The woven top pastry strips will bake with the crostata. This is one of my all time favorite foods and I think you both will enjoy it very much. This is the ‘ultimate’ and totally authentic, traditional ‘pie’ that Italians prepare and devour in celebration of Pasqua! I hope to prepare your recipe soon!! Come sei bella Roz…grazie per i meravigliosi complimenti. This is high praise coming from someone as knowledgeable and respected as you. Che bontà! This is the perfect pastry treat to serve at Easter, and you’re making me wish it were this weekend instead of in a couple of weeks. I just love all these wonderful Easter foods. This looks so delicious. We always celebrated Easter with a savory pie with prosciutto and cheese using the same sweet crust. I just realized that Easter is right around the corner and I have to make this soon! We also have the savory pie along with a wheat custard pie – so many choices! What a rich culinary heritage we have. Buon Pasqua Janie. What a wonderful looking cheesecake. So traditional….am craving a piece right now! This is probably one of my all time favorite holiday traditions; the wonderful crust, subtly flavor of the lightly sweetened cheese and bits of candied fruit. Thank you for your lovely comment Marisa. This reminds me a lot of my grandmother’s pizza dolce. She was Neapolitan but always made pizza dolce rather than the pastiera at Easter and year ’round. Now my big problem: finding the candied fruits! A quality source for candied fruits is Market Hall Foods in Oakland CA – they ship. We also had pizza dolce, however an aunt of mine prepared the pastiera each year. Buon Pasqua!